A question that we get asked frequently by clients who discover a form of fungal decay in their property is “What’s the difference between dry rot and wet rot?” Without a doubt these are the 2 most common forms of fungal decay and below we have an interesting case that one of our timber surveyors in Leeds came across on a recent survey for a commercial client. There are 2 common types of wood rot and these are wet rot and dry rot and both of these are forms of fungal decay can cause structural damage to buildings. Identifying the difference between wood rot is the first step to getting rid of rot from your property once and for all. Dry rot is the most serious form of fungal decay that can cause the most damage to your property and can spread and destroy a large majority of the timber. Wet rot is more common of the 2 wood rot fungal decay but is confined to the area where timber is damp. One of our concerned client had contacted Timberwise Leeds as a result of finding what they believed to be an outbreak of dry rot in their property. 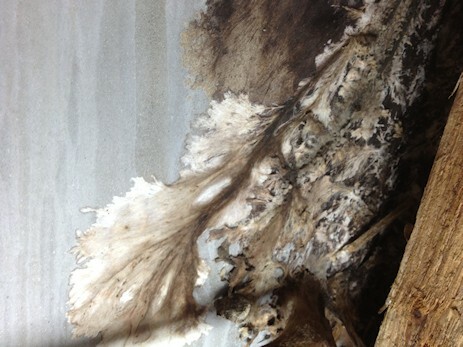 In the photo below is an image of the ‘dry rot’ that the client discovered. In this instance, our surveyor was able to correctly identify that it was indeed a wet rot outbreak (Coniophora puteana) as opposed to a dry rot outbreak (serpula lacrymans). One of the main reasons for this was that for wet rot to grow it requires an area with a higher moisture content than dry rot to enable growth. In this instance, a leaking flat roof caused enough moisture to be present for wet rot to grow to this extent. With the strands of growth, it is very easy to see why the client suspected dry rot. 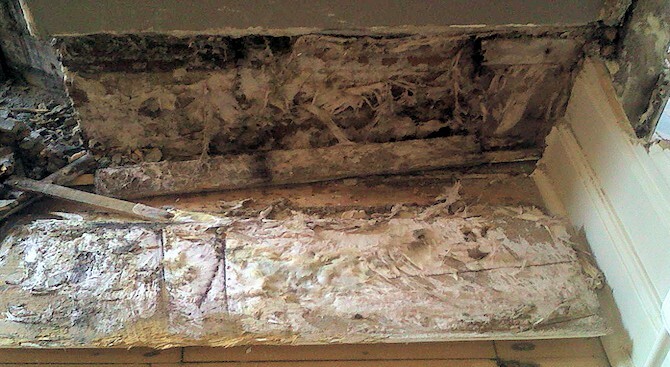 The picture below shows an actual case of dry rot, in this case behind a skirting board. It can be hard to spot the differences between both wood rotting fungi, below are some key features for the signs of both dry rot and wet rot. The paint finish will be damaged it can be a sign of wet rot fungus, however in some cases, the paint can look okay underneath but may be rotting from the back. To learn more about wet rot click the following link. The fungus leaves deep cracks running across the grain with evidence of white sheets (known as mycelium growth) are often present on the wood. Damage is usually restricted to the timber however in some cases there can large flat mushroom-like fruiting bodies can easily grow through finishes such as plaster or paint. To learn more about what dry rot looks like click the following link. How is Dry Rot Treated? How is Wet Rot Treated? Dry rot is the most serious form of fungus decay in a building, spreads onto and destroys much of the timber. On the other hand, the wet rot fungus occurs more frequently but is less serious, the decay is usually detained to where the timber becomes and stays wet. The Wet rot fungus tends to grow on porous surfaces, for example, timber with a high moisture content of around 50% while for dry rot to grow moisture of around 20% needs to be present. If left untreated wet rot can cause major structural problems as it can lead to weakened timbers. For moisture content to be suitable for wet rot growth there has to be a source of constant moisture – this could be as a result of defective plumbing or damaged guttering. Wet rot cannot spread through masonry and will cease to grow when the source of moisture is taken away. Due to the parts of the building that tend to have the correct moisture levels, for example, underfloor areas, dry rot can often cause significant damage before the homeowner is aware that there is even a problem with dry rot in the property. If you suspect that you may have a problem with wet rot or dry rot in your property contact a specialist for advice. The longer a rot problem is left untreated the more it will cost to treat. For help and advice with rot call your local Timberwise office on 0800 288 8660. Timberwise have been treating properties for dry rot and wet rot for over 45 years and have in this time built up a wealth of experience. Alternatively, complete our on-line survey request form and we will contact you to arrange a survey. Phil and Jack were so professional, they have done a fantastic job and are a credit to the company.